THE REVOLUTIONARY NEW 360 DEGREE TOUCHLESS DISINFECTION AND SANITIZING SYSTEM FROM EARTHSAFE. 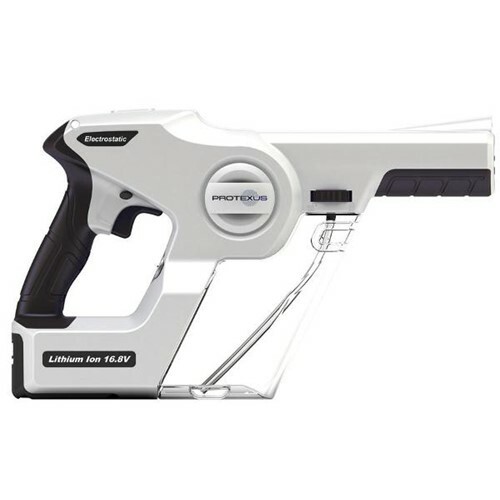 Cordless - 16.8 volt Lithium Ion Battery System Allows the Convenience of cord free cleaning for approx. 4 hours of use. Versatile - Ideal for sanitizing, disinfecting, odor control, pesticides, coatings, etc. Electrostatic On / Off Switch - Electrostatic charge can be disabled or enabled as needed. Tool Free Adjustable Nozzle - Allows the versatility of adjusting particle size for the required application. Quiet- Being only 60 db., its great for environments where noise is important. Lightweight & Portable - Light enough at 3.8 lbs. to quickly navigate from surface to surface and room to room. Head Light - Illuminate work surface to provide a clear view of intended coverage. Trigger Lock - Trigger can be locked in place to prevent accidental spraying. Ergonomic Over Molded Handle - Provides a soft grip for added comfort. Unlike other systems, the Protexus sprayer unique three tiered applicator nozzle is easily adjusted to change droplet size, accommodating any products labeling requirement. This fine-tuning capability provides unmatched flexibility - ensuring consistent performance and versatility, while eliminating the waste and overuse of chemicals.